What's Happening With Our New School? Landscaping and Playground Ideas - What do we want? Outdoor game spaces - large chess/naughts and crosses etc. Coloured doors - can we use them somehow? Are you interested in keeping up to date with our plans for our new school? If you are then come along to our community meeting next Monday 3 December at 2:00pm in our library. Opus will be sharing their concept designs for our hall, administration building and learning hubs. We would also like to ask you about what features you think we need to consider in our landscaping plans. This is a very exciting time for us; we would love to share our updated plans with you as well as get your ongoing input. We have draft plans for our new school! You will notice that the hall is green; this is because one of our students said they would like a rain forest in the new school. The architects really have listened to us and to our students! The next step in the process is for these plans to go to a MOE review committee. Once they have been reviewed a tender process begins as the Ministry seeks potential builders. We then enter the design stage where we look in detail at the features of our school. You can see the hall is coded green, the library and whanau area is orange and the office and admin area is blue. We asked the children what they would or would not like in our new school. Press play to listen to their thoughts. Below is the new Ministry of Education approved Enrolment Scheme, map and home zone description, adopted by our Board of Trustees at its meeting on 31 May 2018. This zone becomes effective on 31 August 2018. There is a government initiative, local schools for local kids, which will mean children only being able to access schools in their local zones. At the moment we take about eighty students a year from out of zone. With this government initiative this will not be able to happen once we have moved to our new site and have a firm zone in place. In preparation for our shift we have been reviewing our current school zone. Our proposed future zone extends north down Marshlands Road to Lake Terrace Road and west up Bealey Avenue to Geraldine Street. There are some dual zone areas proposed on the western side and northern side of Shirley Boys' High School. A dual zone means that children living in that area can enrol either with us or with Shirley Primary School; they have a choice. Siblings of children who are currently enrolled or are out of zone, will get first preference for enrolment so they should not be disadvantaged by any zone changes. The final decision has been made from the Ministry. Our school will be rebuilt on the Shirley Boys site in North Avon Parade. Shirley Boys will be relocating to QEII in 2019: at that time the existing school will be demolished and our new school will be built. We anticipate moving into our new school at the beginning of the 2020 school year. This is an exciting prospect and opportunity which we are already planning and preparing for. We know we will be built as an innovative learning environment so therefore we are using the time before we relocate to grow and refine our collaborative teaching practises. Many of our existing classrooms have been modified allowing teachers to work collaboratively: all teachers at Banks Avenue are currently teaching collaboratively in teams of two. 12 May 2016 - Have A Say - What Site Do You Think Would Be Best? Proximity to our current site. Ease of traffic flow around Creswell Ave.
Access to develop a school with strong links to all the sporting facilities. 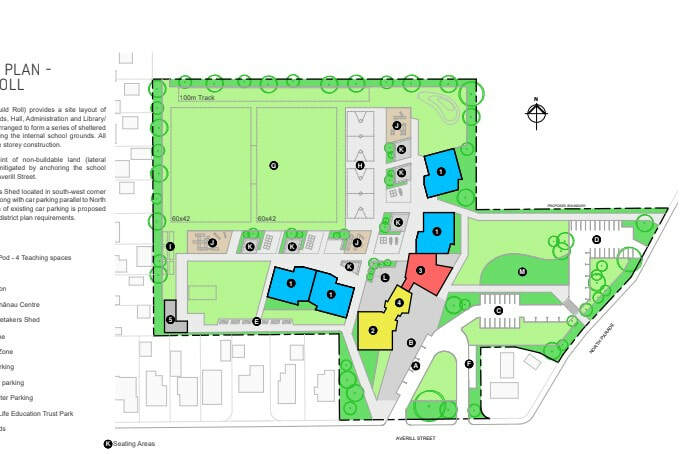 Potential for the school to develop into a community hub with facilities that could be used by the community, e.g. all-weather turf, school hall. On a main bus route. Current education of our students not being impacted on as the build takes place. Traffic congestion at pickup and drop off times. Loss of the park for recreational purposes. Relocated to the Shirley Boys site, adjacent to Shirley Intermediate. This would not happen until Shirley Boys moves to QEII. Be rebuilt on our current site, but closer to the back fence, where we think the land may be more stable (this is being checked out). In the next few weeks we will be sharing more information with parents and seeking your input for what you would like for the future of our school. Tonight Derek Wenmoth gave a presentation on Future Focused Learning in the Rae McDonald Library. Derek is currently the Director of eLearning CORE Education Ltd, a not-for-profit educational research and development organisation based in Christchurch, New Zealand. This presentation is very important as it gives us an insight into what we need to be thinking about with our new school. If you missed tonight's presentation, don't worry, you can watch it by clicking play below. Click here to find out more about Derek and follow his blog. We are still waiting to hear from the Ministry Of Education about where our new school will be sited, however, we have not let this delay or stop other aspects of our journey forward. Staff are on a learning journey as are our Board of Trustees in relation to future focused teaching and learning. Most staff are involved in an intensive twenty week professional development module where they are building their own understandings while working collaboratively with other staff members. Next term we will see some of their new knowledge put into practice in class rooms. As well as this we already have clusters of staff throughout the school working in collaboration with each other as they plan and teach together. We have plans to open up another two teaching spaces to allow this type of co-teaching to occur more easily. Our BOT have had meetings with the Ministry and are at the beginning stage of thinking about design briefs for the new school. Later this year we intend to review and revise our current school vision and values to ensure it is aligned with our new thinking and understanding, however, in order to do this we need to ensure our parent community is knowledgeable and understanding of the shifts in education that lay ahead. We have organised a parent evening hosted by one of the foremost educationalists in this field, Derek Wenmoth. Derek will share his vast knowledge with us and facilitate parents voicing their wonderings, needs and hopes for their children. This is being held on Wednesday 27th May from 7pm-8:30pm in the Rae McDonald Library. Don’t miss this opportunity to hear from the best and to have a say in our new school. In order to help with the parents attending this session we will provide child care in one of our classrooms. Please RSVP by Friday May 22 so we can gauge numbers and ascertain whether we may need a larger venue. The following link is to a video on the creation of learner centered teaching – this gives great insight into the things we as a school community need to be thinking about as we move forward into the design phase of our new build. Our school was damaged in the February 2011 earthquakes so the Ministry of Education are going to re-build us on a new site. Building will commence in 2016 with the intent that we will be ready to move into our new school during 2017. Our new school will be built as a Modern Learning Environment enabling us to provide future- focused education to our students. During the next two years all teachers at Banks Avenue School will get the opportunity to work collaboratively building and increasing our knowledge and understanding of future focused education so we can continue to offer our students a first class education and remain the school of choice for all. An opportunity to design and build a Modern Learning Environment is an opportunity to create spaces fit for 21st century learners. As much as it’s about buildings and furnishings, it’s about creating spaces that promote learning which is personalised, student-centred, engaging and connected to real problems and the real world. Modern Learning Environments can help create the environment, mind- sets and learning capacity to help our young people make the most of their talents on the local and global stage. Click on the button above to find out more about Modern Learning Environments and to keep up to date with our staff's professional learning.